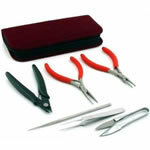 Jewelry making kits are a great way to get started making jewelry. They're great for those of us who've been making jewelry for awhile too. Here's why I love kits and why I think they're an awesome buy for anyone, no matter what your level of experience. Usually a kit includes a design with instructions, and all the beads and findings. Sometimes tools are included, but usually not. Kits save you the hassle of collecting all the supplies separately yourself, and you can concentrate on learning the techniques without having to design the project yourself. In most cases the designer has already worked out any design problems so you don't have to do any design troubleshooting either. They save you money too. Beads, tools, findings- they can add up to a huge investment especially if you don't know exactly what techniques you like yet. Kits let you get your feet wet a little before jumping in. Sometimes you just want to enjoy making something without the hassle of fiddling with the design. I often feel like making something late in the day when I'm tired and don't want to think too much. Other times, I'm working on a new design and I get so frustrated I want to throw it out the window. Sometimes designing your own jewelry is a pain because invariably (at least for me) there are problems that need solving before you can wear your new creation. The beads end up clashing. You're missing a component and need to go shopping before you can finish your design. Or maybe your design hangs funny. Or maybe what you envisaged in your mind ends up looking just plain ugly. Having a kit on hand means I can satisfy my compulsion to create without the frustration of the more challenging parts of designing jewelry. I can produce something pretty and feel like I've accomplished something even when I'm tired or angry. Buying a kit means that you're only buying what you need. It's more expensive per bead, but your bill ends up being less overall. You don't have all the leftover beads junking up your house either. The "Stash" - Anyone who makes jewelry has a "stash". A Stash is a collection beads never used, leftover beads from previous projects, and beads reclaimed from old jewelry. Anyone who has one loves their Stash, but there comes a point in every bead junkie's life when they can no longer justify spending even more money on beads that they may or may not ever use. Sonoran Beads : Sonoran Beads has some beautiful art glass bead necklace kits as well as gorgeous designer lampworked glass beads and borosilicate beads (my personal favorite). Amazon.com has some jewelry making kits - here's a beginner's jewelry making kit that includes a beading tray, tools, beads, ribbons, cords, clasps, and findings. Joann.com : Joann has a number of different jewelry making kits. There are lots of kids jewelry kits, some nice watch/bracelet kits, and a beginner Wire Worker Kit too.